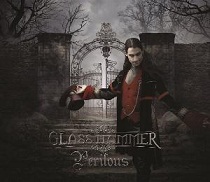 Review: "Glass Hammer: Perilous" - Sea of Tranquility - The Web Destination for Progressive Music! Perilous is the latest release from prog rock veterans Glass Hammer, not only another stellar concept album from the band, but also the third consecutive collaboration between the now set line-up of Steve Babb, Fred Schendel, Jon Davison, and Alan Shikoh, with Randall Williams providing session drums. No doubt Davison's recent hiring as the lead singer of the legendary Yes will bring plenty of new fans to the Glass Hammer family, but in the end it's all about the material, and Perilous is another fantastic collection of progressive rock that this band seems to so consistently deliver. If you loved their previous efforts with this line-up, If and Cor Cordium, then no doubt Perilous will prove equally as thrilling. The story here seems to center around the possibilities that one can experience beyond the cemetery gates, and in traditional Glass Hammer fashion, the CD booklet is adorned with enchanting artwork and the full lyrics to the storyline that you can follow along with. Davison, with his Jon Anderson-ish vocal delivery, does a masterful job once again, his soft, high pitched vocals soaring over the grandiose keyboard arrangements from Schendel & Babb and Shikoh's tasteful guitar work. Just listen to Alan's deft acoustic touch on the wonderful instrumental "The Years Were Sped", a lovely little piece that will certainly please fans of Steve Howe's acoustic works. Of course, with Glass Hammer, the attention usually focuses on the longer, more epic & symphonic numbers, and there are no shortage of them here. The upbeat "Our Foe Revealed" is chock full of Babb's muscular bass work and Schendel's vintage sounding keyboard lines, along with a catchy vocal from Davison. Other highlights here include the melodic "The Sunset Gate", the mysterious "Toward Home We Fled" (complete with some fantastic Moog & Mellotron sounds), the menacing instrumental "The Wolf Gave Chase" (which reminds of classic Genesis), the heart-tugging, achingly beautiful "In That Lonely Place" (with fantastic lead vocals courtesy of Amber Fults), and the symphonic closing number "Where Sorrows Died and Came No More". Through it all, the musicianship is stellar and the melodies well thought out and delivered. Though I've probably said it numerous times in the past, if you love vintage keyboard sounds, you get a wealth of them on each Glass Hammer album, and Perilous is no exception. In the end, Perilous is a like an exciting yet ominous musical journey, one that you'll want to take over and over again. If Glass Hammer's intention was to get their fans to give some extra thought about what life and death is all about, taking this little 'perilous' ride might certainly do just that. Either way, this is another gem from a band that just keeps delivering one winner after another, and easily one of 2012's best progressive rock releases. Excellent review; could I just respectfully point out that the album is also available as a double heavyweight vinyl release, with three bonus tracks and a coupon for mp3 download included, on Plane Groovy records? An individually numbered release of just 500 copies, buyers are able to receive either the lowest available copy number or else a specific copy number if it's still not taken. Come over to www.planegroovy.com to place an order.